White House correspondent for Fox News, Major Garrett, has left the network and TV, returning to print journalism. This comes after Garrett helped Fox News gain the coveted front row seat at the White House Briefing Room. Wendell Goler and Mike Emanuel will share the White House beat. “We think Major Garrett is a legitimate reporter,” former White House Communications Director Anita Dunn said in the midst of the administration’s battle against the network. Of course, if you want an example of Major Garrett twisting President Obama’s words, here you go. And, if you want to see Wendell Goler taking an Obama quote out of context, you can find that here. But Goler has also provided a voice of reason about the czar issue. As early as Sunday, the White House Correspondents’ Association will decide which news organization will be awarded a recently-vacated front-row center seat in the White House briefing room. The contenders? National Public Radio, Bloomberg News—and Fox. Yes, Fox—which we all know is actually a tool in the right-wing propaganda machine, not a legitimate news organization. They simply don’t deserve the best seat in the White House briefing room—a seat held for years by journalist Helen Thomas until she retired recently. Can you sign the petition today? Tell the Correspondents’ Association to give the best seat in the briefing room to NPR, not Fox. Then, please forward this email to your friends and post on Facebook and Twitter so we can spread the news faster. Already 140,000 people have signed onto this call through CREDO Action. Help us get up to 250,000 before the meeting on Sunday! Winning this seat would give Fox legitimacy it simply doesn’t deserve—not after years of race-baiting, smears against progressives and Democrats, and spreading right-wing propaganda 24/7. So instead we’re calling on the Association to award the seat to one of our nation’s premiere news organizations, which has served the public for years and currently reaches an audience of 27 million. PERINO: I could have taken that tack, but I thought it was not the right thing to do and I think it’s mostly because it’s really unproductive, it feels un-American, and it’s not inspiring. MS. PERINO: We have not heard back from them on that specific matter. We anxiously await any response that we would get on it. But I think it’s quite telling that they have been silent. The reason that we sent the letter yesterday is because we had gotten fed up with the way that the President’s policies are being mischaracterized, or the situations on the ground weren’t being accurately reflected in the reporting. We had complained before. And it just reached a boiling point when things had boiled over when we believed that NBC News specifically edited out — intentionally edited out — something that the President said in response to a question in an interview regarding Iran, and that it mischaracterized the whole interview because of it. As regards the civil war, I remember very distinctly how there was quite the pomp and circumstance when NBC, on the Today Show, decided to declare — that they were declaring that Iraq was a civil war. But since then, after the surge and things certainly improved in Iraq, NBC has never had a corresponding ceremony to say that Iraq is not in a civil war. I was just curious to find out what they believe. And the same goes with the economy. When we got the numbers just two weeks ago on the GDP for the economic growth, it said that we had grown at 0.6 percent. And yet the anchor that night decided to disavow that number. We’re just curious what part of the official government data that’s been coming out for years do they not agree with. So we haven’t had a response on that. And just another point on this is that President Bush is going to continue to state what United States policy is for the next eight months, and certainly during the six months that there’s an election going on. If, for example, if tomorrow President Bush says that he believes that the tax cuts should be made permanent, that doesn’t mean he’s attacking anybody; he is stating his policy. And we just want to make sure it’s really clear that we’re not going to allow the President’s policies to be dragged into the ’08 election unnecessarily and unfairly. 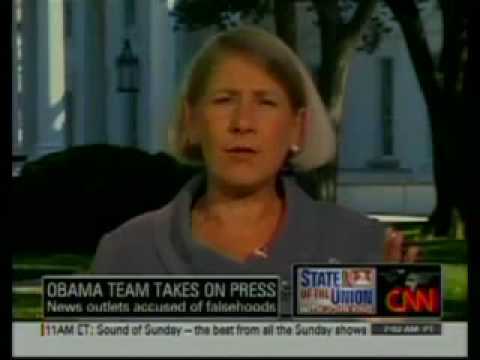 White House communications director, Anita Dunn, made a comment prior to working with the White House that the Obama campaign wanted to control their message in regards to their direct video method, not the media itself. Unfortunately, Glenn Beck didn’t see it that way. Instead, he turns it into a “hands around your throat” conspiracy theory. BECK: OK. So this one has come out this weekend, that we controlled the press. And what people are saying about this is that, see? They’re controlling the press. Well, let’s be honest here. Isn’t that what every candidate tries to do? If you don’t control the press, if you don’t get your hands around the press, they’re going to have their hands around your throat. It is a struggle to the death — not for Obama. I mean, they would have their hands all over you stroking your smooth pecs and saying, “Oh, you are just so hot.” So it’s never been that problem for Barack Obama, but that’s what you do. DUNN: A huge part of our press strategy was focused on making the media cover what Obama was actually saying as opposed to, you know, why the campaign was saying it, what the tactic was, that we — we had a huge premium both on message discipline, on people in the campaign not leaking to reporters and people in the campaign not discussing our strategy, and also on making the press cover what we were saying. It’s nothing new for campaigns and administrations to release videos. In their case it was a winning strategy to stay focused on the message, not a commentator’s version of it. Fox News has been actively playing the victim regarding harsh criticism from the White House recently. As you may have seen here, White House communications director, Anita Dunn, called Fox News “opinion journalism” and a “wing of the Republican Party.” Previously the White House blog listed falsehoods aired by Fox News regarding the Olympics. HANNITY: We have a White House that has now set up a Web site specifically to attack the FOX News Channel because we ask tough questions and they do not like that. They’re not used to that with the fawning news media. So — I mean is this an enemies list? It seems like it to me. I can’t imagine a Republican doing this without, you know, a media outcry. Note that the White House has not actually “set up a Web site specifically to attack the FOX News Channel,” but rather a blog wherein they’ve addressed Fox News twice (see above). If there is a web site that matches Hannity’s description, we’d probably know about it… It appears to be, instead, another in a long line of falsehoods. 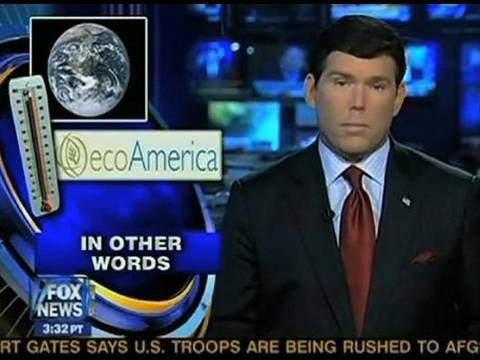 Enter the hypocrisy of Fox News. E.D. HILL: You know, I’m sure you know from watching this program that, you know, Bill has, you know, has been reporting for more than a year on a pattern suggesting that NBC News basically panders to the left and is, in essence, in the pocket for Barack Obama. Why go on a venue like that to begin with? GILLESPIE: Go on a venue like MSNBC? So, they can dish it out, but can’t take it. Take, as another example, Glenn Beck and Gillespie, mentioned above, talking about the Democrats allegedly “trying to blackball Fox” in regards to debates in 2008. BECK: While their [Fox News's] journalists clearly or their commentators are clearly conservative, nobody in Washington is trying to — the Democrats are trying to blackball Fox by not going on any debates, et cetera, et cetera. You don’t see Republicans doing that to NBC, do you? GILLESPIE: No, and sometimes I question why… It is beyond me frankly. Keep in mind that Gillespie was White House counselor while Bush was President and accused NBC of deceptive editing. It was that same White House that was caught taking an ABC broadcast, editing it to paint a positive picture of political progress in Iraq, and redistributing it. Don’t forget that the Bush administration granted Fox News unprecedented access. Where was the outrage from Hannity, Beck, or anyone else at Fox News when that was going on? They’re widely viewed as, you know, a part of the Republican Party — take their talking points, put them on the air, take their opposition research, put them on the air, and that’s fine. But let’s not pretend they’re a news network they way CNN is. Fox is playing the victim when President Obama skipped the network in a round of recent interviews after the network previously dismissing the President’s other speeches. You have people on FNC falsely claim that the White House does not call on them at press conferences, get caught manipulating video of a previous speech, spread falsehoods about so-called “Czars,” acuse Obama of “indoctrinating students,” call Obama a “racist” and “dangerous,” promote tea parties, decide to not show his press conference on network TV, etc. etc. etc. and now they’re whining about being not being included with the other networks. “We figured Fox would rather show So You Think You Can Dance than broadcast an honest discussion about health insurance reform,” White House spokesman Josh Earnest told ABC News. Earnest was referring to the TV show FOX TV broadcast September 9 instead of the president’s speech. A lot of focus is being put on so-called “Czars,” or advisers, in the Obama Administration, even though the same faux outrage was not staged for advisers of previous administrations. So, why the outrage? Why the new terminology? Sean Hannity tries to answer that, and fails. – On July 13, Obama did use the term “Drug Czar” when referring to Gil Kerlikowske, director of the Office of National Drug Control Policy. – Hannity’s March 11 clip of Gibbs saying, “I think I’ve been asked in this room any number of times if the czars in our White House to deal with energy and health care had too much power” was in response to a reporter’s question. In fact, the first person to use the term “czar” in that briefing was Fox News reporter Major Garrett. – At the Radio and Television Correspondents’ Association dinner in June, Obama was joking when he said, “ABC is planning a series called ‘Dancing with the Czars.’” It was part of his comedy routine at the dinner. – Hannity’s fourth clip was taken from the same March 11 press briefing as his second clip. In fact, it was in response to the exact same question, and came just a sentence later. Fox News’ Major Garrett, whom Glenn Beck claimed to never gets to ask questions at the White House, asked White House press secretary Robert Gibbs about people claiming to be on a so-called list and receiving unsolicited email from the White House. Fox News then edits video to show Gibbs using the word “list” first in order to back up Garrett’s claim of said act. The actual transcript tells a different story… Note the bold sections and where they match up to the actual transcript. GARRETT: I have three times now told Robert Gibbs I have emails to present to him or anyone else he assigns at the White House to look into this, provided I receive substantive answers back as to how these people’s names ended up on a White House list. And remember, I never said “list” until Robert Gibbs said “list.” He said it first, then I repeated the word “list,” so apparently there is one. I don’t say that; he said it. GARRETT: — I receive e-mails from people who have never, ever signed up for anything related to this White House, Senator Obama as a candidate, Senator Obama as anything, and have received e-mails from David Axelrod. How could that be? GARRETT: So what you’re telling me is I need to give you these people’s e-mails so you can check them on a list? I’m just asking. GIBBS: I’d have to go back and reread the email. GARRETT: — for the president than a public option? GIBBS: Let me be clear — I thought I was a minute ago, but I’ll take another whack at it — this is an option that provides choice and competition in an otherwise narrow or closed insurance market. That’s the president’s goal, is to ensure that if you didn’t get your health insurance through your employer, you didn’t have those type of options, that you would have something that might compete with the only game in town. That’s — I think that’s in David’s email, choice and competition. GARRETT: Speaking of the email, how was the list for who would receive it determined? GIBBS: I believe it’s for people that have signed up to receive email updates from the White House. GARRETT: Let me finish my question, let me finish my question. GARRETT: Let me finish my question. GIBBS: I’d have to look at who you said got the email. GARRETT: I mean, do you seek other pieces of information identifying who might be curious about health care outside of people who have asked for emails? GIBBS: I’m sorry, say that again. GARRETT: Do you in any way seek databases or information about people who might be interested in health care? GARRETT: I mean, folks have emailed me — I just want to know — would like to know how they get an e-mail from the White House when they have never asked for one. GIBBS: Well, you’re asking me if they’re on a list. GARRETT: Perhaps I’m not phrasing this correctly. They’re telling me they’re not — they can’t be on a list because they never asked for an e-mail from the White House.